You probably remember the navy tube dress my sister made for me because I couldn’t find anything long enough to qualify as a maxi (for me that is)! I’m still rocking it! And how about this neon color block bag from oasap? Pretty swanky, right? I certainly think so – I love the mix of turquoise and pink that frames it; the perforated details in the front are really lovely as well! It also happens to work like a dream with the hot pink silk shirt I just had for ages but rarely used before! Because the shirt is oversized I decided I should wear it knotted just above the waist line! 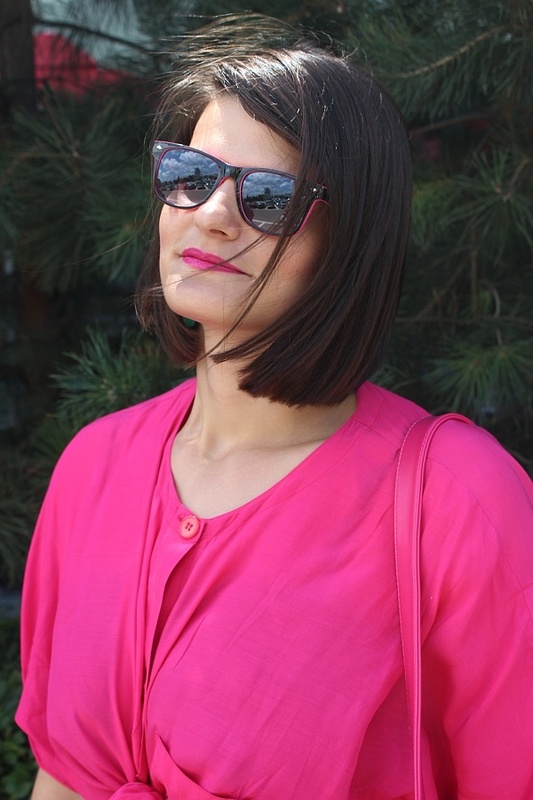 I’m also debuting a very cool pair of black sunglasses with a surprising pink layer that’s playfully peeking from underneath. Sometimes you just have to match your clothes with the lipstick you’re wearing and this was one of those days. You can never wear too much hot pink! What a briliant outfit! I love how the dress is really long, almost covering your sandals! The bag is really special! Love everything about this look! Could you tell me the brand and color of your lipstick? I'm speachless: the dress, the bag, the bracelet, the lipstick - WOW! Am uitat de ochelari care sunt superbi! love the outfit! cute maxi skirt! I love your bag and sunglasses! Your outfit has a great color balance and I love how confidently you wear all that color! The bag is really special - I want one! And I love your jewelry! The dress is beautiful as well and I love your smile! Sensational bag and long dress! I love it! You look cool! Hola! Antes de nada, gracias por tu comentario en mi blog! !Yo también te sigo!! Me encanta el look, es precioso y me gusta mucho esa mezcla de colores! !El bolso es precioso! !Me encanta!! Beautiful! The mix of color is great and I'm loving the bag! i love your outfit, gorgeous color combination..
Foarte frumoasa combinatia de nuante de albastru cu roz! :) Felicitari!